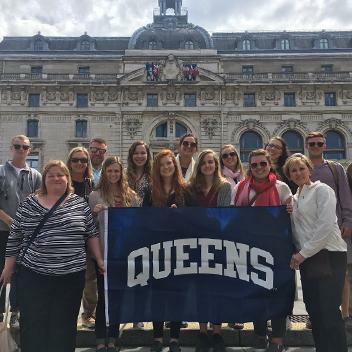 Study abroad is a core part of the Queens experience. We believe in a global perspective so much that we provide traditional undergraduate students with a fund to use towards an international experience. Study abroad is about education as much as travel: 95% of students who studied abroad found a job within 12 months of graduation, a testament to the self-confidence and skills gained by living and learning in another country. Above: Calista Malone '17 explores The Long Room at the Library at Trinity College in Dublin, Ireland. Rio bound! 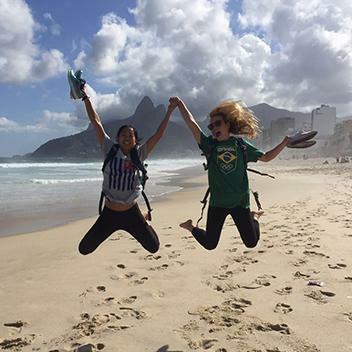 In 2016, 19 students went to Rio de Janeiro on a faculty-led program to create digital media packages about the Olympics. 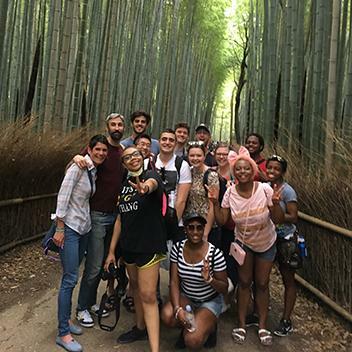 A 2017 history and philosophy program to Japan took students to a bamboo forest in Kyoto, a Zen Buddhist temple, and World War II sites. 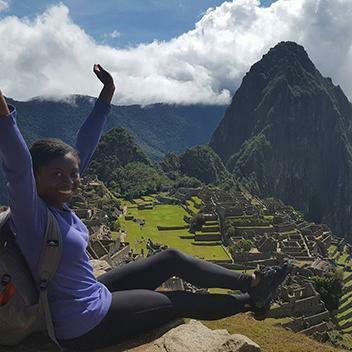 Milan Golding, a music major and track athlete, explores Machu Picchu during a language immersion program in Peru. 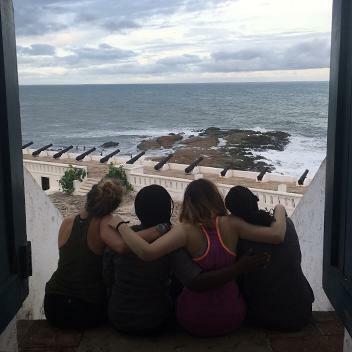 Interning abroad: Four music therapy majors interned in Accra, Ghana at the Music Therapy Association of Ghana. 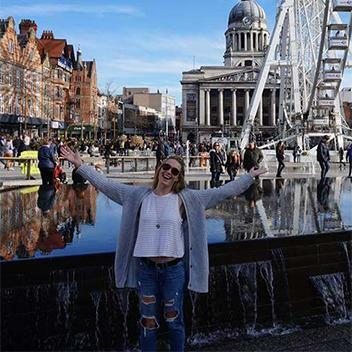 Callie Malone, an English literature and creative writing major, enjoys a side trip to Amsterdam during her semester in the UK. Students on a 2017 faculty-led trip to Paris were met with a surprise guest: President Dr. Pamela Davies! 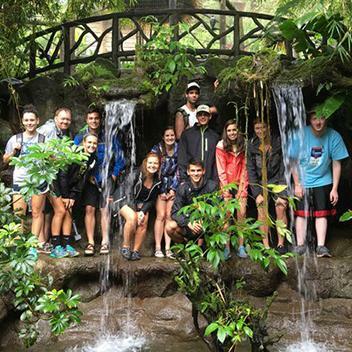 Students explore Costa Rica on a faculty-led program to study sustainability practices in food production. During her semester studying in the UK, sport management and marketing major Alex Thompson takes a break to explore Amsterdam. These are our most popular programs. You’ll travel about 10-14 days, traveling with classmates and your professor to a region that builds upon a semester of study. You may study biodiversity in Ecuador, British literature in London, or art history in Florence. Increase your language proficiency with a language immersion program. You’ll live in another country for four weeks, gaining cultural immersion and speaking the native language. Dive deeper into another culture. We’re a member of the International Student Exchange Program, which is a network of 300 universities in over 50 countries. You’ll have a world of options to explore for a semester of study. You can also spend a summer studying business in France and Shanghai. All of our traditional undergrads do internships, and some choose to do theirs overseas. We have partnerships that enable us to offer affordable, professionally immersive internships during which you work abroad and even live with a local family. You can apply for scholarships to help offset the cost, if needed. Students majoring in business, political science, or international studies may participate in summer programs offered through our partnerships with ESSCA and EM Strasbourg, two premier business schools in France. Both schools offer a unique perspective on global business and politics. See how a recent class took their study of Irish literature to Dublin for an unforgettable experience. "Being culturally immersed was a priceless experience. My Spanish improved drastically and I was able to visit Barcelona, Seville, Toledo, Lagos, the island of Gibraltar, and Chefchouen just in one month!" "To have [study abroad] finances already taken care of in my tuition allowed me to take advantage of the international internship program. Studying abroad is something every Queens student looks forward to."